Tourism Matters | News | Opinion | Discussion | Advice | Innovation | Development: Royal Golf Hotel is Back with an Online Edge! The Royal Golf Hotel in Dornoch is reopening and The Edge are delighted to have been appointed to develop the hotel's online presence ahead of its April opening. In advance of Christmas we were asked to make sure there was at least a temporary presence online and Steven in our design team has pulled together the holding site which incorporates a Google map, external links and the Bookassist online reservations system. The Royal Golf Hotel Facebook page has also been launched and will form an important part of the hotel's social media campaign over the coming weeks. 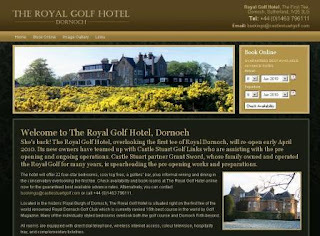 It's really great news for the Royal Burgh of Dornoch that the Royal Golf Hotel is reopening and we look forward to working with Grant Sword and his team to maximise the returns from the website.